New Zealanders and Australians are neighbours and extended family who love to trade insults – and much else besides. Exports flow freely between the two countries, and the labour markets are mobile. Some pundits have even discussed sharing a single currency. Australia was first settled around 50,000 years ago, and New Zealand around 1200–1350 AD. Europeans first thought about the two countries when Charles de Brosses, a French scholar, described an imaginary southern continent called ‘Australasie’ (south of Asia) in 1756. James Cook mapped New Zealand and the east coast of Australia in 1769–70 on his search for the continent. British colonies in Australia and New Zealand were extensions of the colony of New South Wales. Many people from Australia settled in New Zealand, including ex-convicts, farmers and miners following the gold rushes. When the Commonwealth of Australia brought the Australian colonies together in 1901, New Zealand did not join. Many New Zealanders thought they were better than Australians. New Zealand and Australia learned from each other’s experiences, and shared initiatives. For example, both established compulsory arbitration in industrial disputes (which meant employers had to bargain with registered unions, and if they could not agree, an arbitration court decided), and welfare systems. They had a shared British heritage of law and the system of Parliament. In the late 20th century more formal ties were created, and New Zealand participated in the Council of Australian Governments (COAG) from 1992. New Zealanders and Australians have fought together in wars. 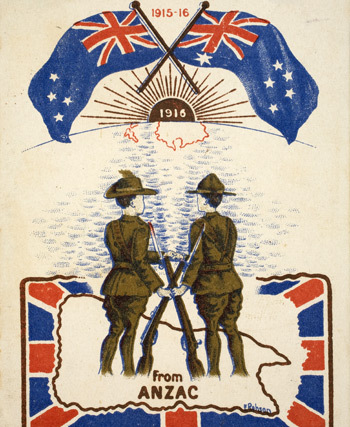 The Australian and New Zealand Army Corps (ANZAC) served at Gallipoli, Turkey, during the First World War, and the anniversary of the original landing (25 April 1915) became a kind of national day for both countries. Australia is more concerned than New Zealand about military threats from Asia. In 1951 Australia and New Zealand made an alliance with the United States, ANZUS. In the 1980s New Zealand and the US disagreed about the nuclear aspect of the alliance, and the US stopped cooperating with New Zealand under ANZUS. In the 2000s Australia took part in the US-led invasion of Iraq, but New Zealand refused to go. Forces from Australia and New Zealand have been involved in peacekeeping operations in Bougainville, Timor Leste (East Timor), the Solomon Islands and Tonga. In 1983 New Zealand finally got reciprocal trade arrangements with Australia under Closer Economic Relations (CER). By 1990 there were no tariffs or restrictions on trade between the two countries. Citizens of New Zealand and Australia can live and work freely in both countries. In 1960, one in 50 Māori lived in Australia. In 2006, one in six or seven did. The two countries share cultural icons, including foods such as Anzac biscuits, pavlova and Weetbix breakfast cereal. There are many shared sporting competitions such as netball and rugby matches.